I had never heard of Kouign Amann until about six months ago when someone in one of the food groups I am in asked if anyone was making them in Cleveland. No one was. The closest bakery seemed to be in Pittsburgh. Well, we have one now at a delightful coffee shop on Chester Avenue across from the Cleveland Clinic. 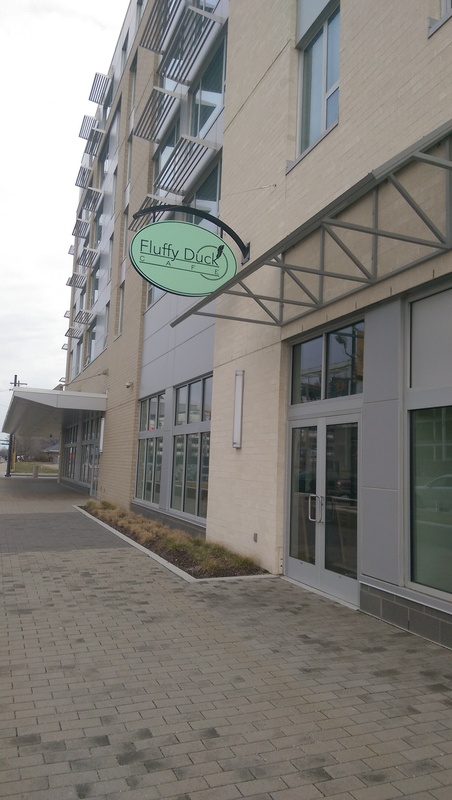 The Fluffy Duck Cafe opened in December 2016. It is located on the ground floor of the Innova building across from the construction that will be the Cleveland Clinic’s Health Education Building. I had watched the building go up for a while now and was curious who the tenants would be. I first heard about the Fluffy Duck when Chef Doug Katz raved about it right after it opened. I should have known it would stand up to the expectations. 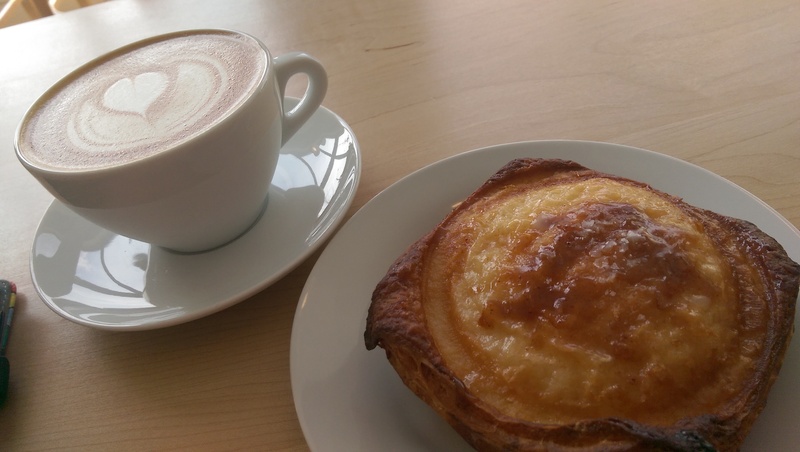 I delivered my translations early this morning and could use a jolt of caffeine for the next one, so I decided to treat myself to a nice coffee and pastry. When I saw they were serving a Kouign Amann I knew what I was going to order, since I’ve been wanting to try it. I love the format of the Fluffy Duck Cafe. All of the windows gave the cafe a bright and sunny feeling. The clean white walls and clean lines of the wooden tables and chairs and those lining the windows gave it a modern feel (you can see the tables reflected off the bakery case in the third picture). They offer free wifi, so I can see myself coming here with my laptop to translate when I need a change of scenery. 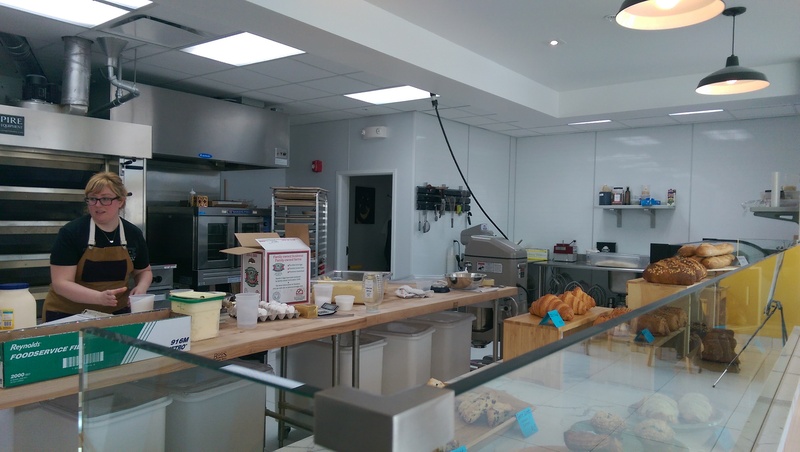 The open kitchen allows you to watch the staff busy rolling out dough and making the pastries. The baker had a container full of eggs when I was ordering, and she was turning them into dough. I wanted a coffee and checked out the list of available coffees. I was leaning towards a cappucino until the flavored lattes caught my eye. I was immediately intrigued by the orange cardamom latte. They use local whole milk and good quality coffee beans from a roaster in Grand Rapids. It is a fine cup of coffee. I was given a plate with my Kouign Amann, and the barista whipped up my latte, complete with delightful milk foam art. I carefully carried my plates to a table and looked forward to biting in. They had been holding a Coffee with a Cop event, so when the police officer saw what I ordered he raved about his and told me what a delight it was. As he explained, it is flaky and sweet and then you hit a bit of salt. He told me I would enjoy it, and I did. I also enjoyed chatting with him as he was on his way out. Let me tell you, he was right. 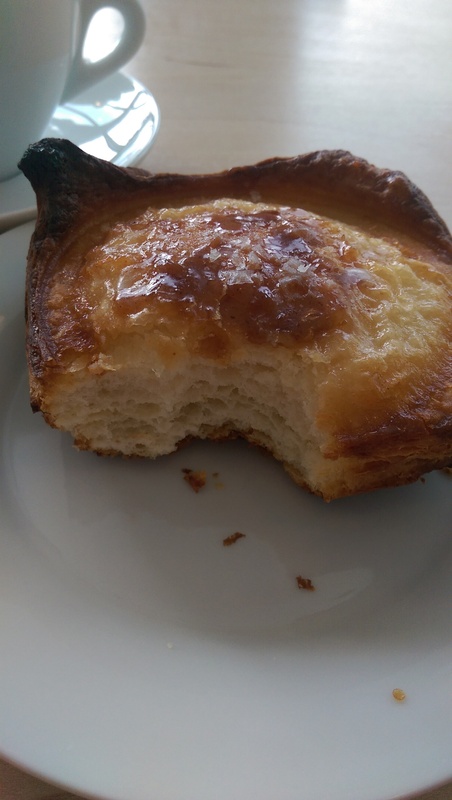 I don’t know how it compares with other Kouign Amanns since it was my first one, but this one was delicious. Light and flaky with a nice crumb to it, the caramelized topping with a hit of salt really made an enjoyable pastry. I will definitely be back. The ham and cheese croissants and almond croissants also intrigue me. The menu is limited to pastries and a few lunch-type items after 11 a.m., but what they do offer they do well. 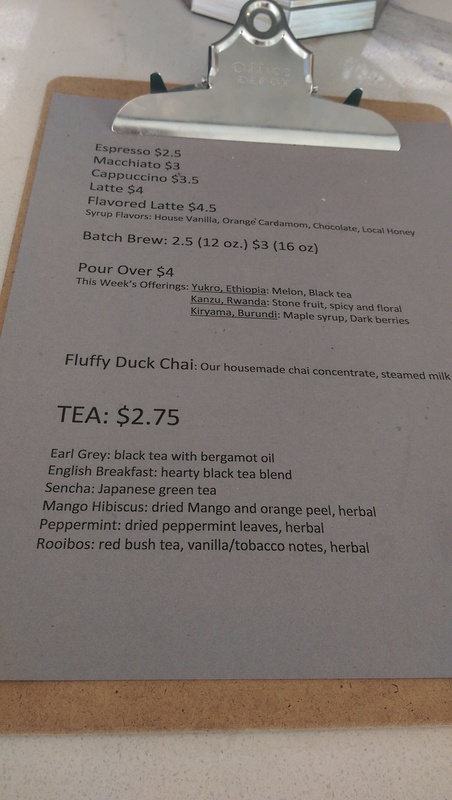 The list of flavored lattes and teas sounded nice, and I believe they might change them out since the menu is a piece of paper on a clipboard instead of a hanging board. They also offer pour overs with three weekly offerings. 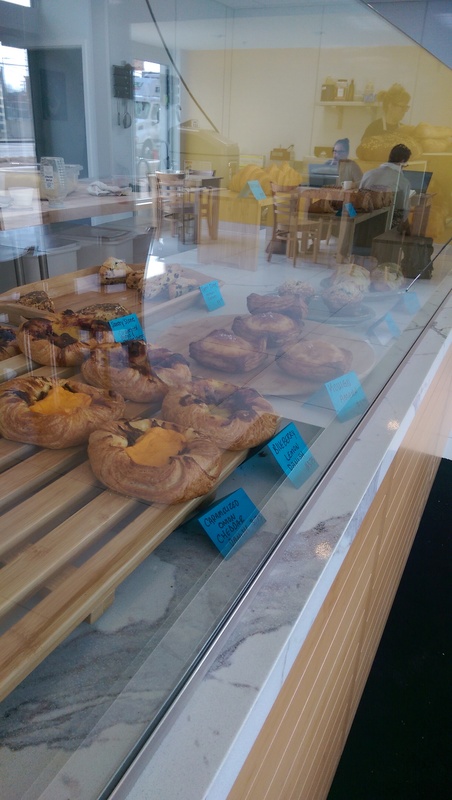 So if you are looking for a nice little respite or you have been looking for a Kouign Amann in Cleveland, you need to check it out.